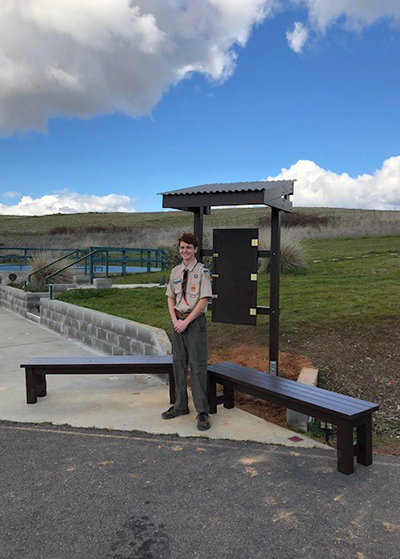 The first Eagle Scout Project at the Community Observatory in Placerville was recently completed thanks to the dedication and hard work of an El Dorado County student. Eagle Scout Thomas Ridgeway, a senior at Ponderosa High School, worked with Community Observatory team members to complete the endeavor. The project was to construct two benches and an information kiosk to provide seating and act as a posting board for general information, news, updates, and pictures from the new imaging dome. “I was made aware of the need for work to be done at the observatory by an adult in my troop. I was glad to take it up because I have a personal interest in the work and observations that go on there,” Thomas Ridgeway expressed. “It was an honor to complete this project because I know that my work will directly benefit the public and that the project is providing for a respectable organization.” After meeting to formulate and approve plans, the construction began in mid-February and was completed in early March. Ridgeway received help from nine youth and six adults, and the project took a cumulative 110 hours to complete. The Eagle Scout rank is the crowning achievement and highest rank attainable in the Boy Scout program. It is estimated that only four percent of boys who enroll in a Boy Scout troop achieve Eagle Scout ranking. Requirements include, among others, earning at least 21 merit badges, completing all previous ranks, and executing an extensive service project. The Eagle Scout Project is designed to give the prospective Eagle Scout a chance to design, execute, and lead a service project that benefits the community in some way. After completing his project, Ridgeway submitted his paperwork to the Eagle Board of Review, where he was accepted and granted the rank of Eagle Scout. After graduation from Ponderosa High School, he will pursue a degree in Aerospace Engineering at San Diego State University. The Community Observatory has been providing the community and schools with free and guided opportunities to explore the sky using world-class amateur astronomy facilities with experienced docents. Since opening in 2006, the volunteer docents have provided these opportunities to over 92,000 visitors! The Observatory was a Rotary Club of Cameron Park Centennial Project in recognition of the 100th anniversary of Rotary International and operates in partnership with the volunteer docents, the El Dorado Campus of Folsom Lake College, and the El Dorado County Office of Education. Representatives from all four groups meet regularly to keep the Observatory operating into the future.